A dear friend had brought a bowl full of amazing peaches to a party at my home and left them for me to make something special for the church potluck the next day. I searched and searched for ideas. I wanted something healthy but sweet. But everything I found was basically a variation of a peach crumble which has lots of flour and butter. 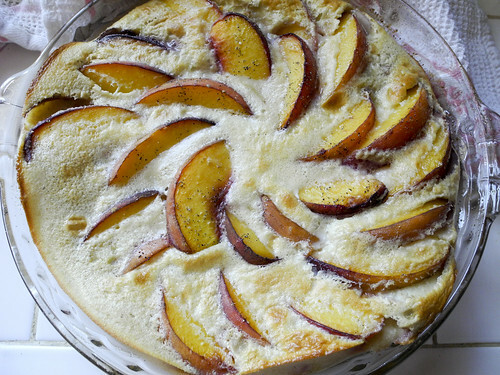 But then I found a recipe for a clafouti and I thought how lovely it would look with the peaches fanned out. 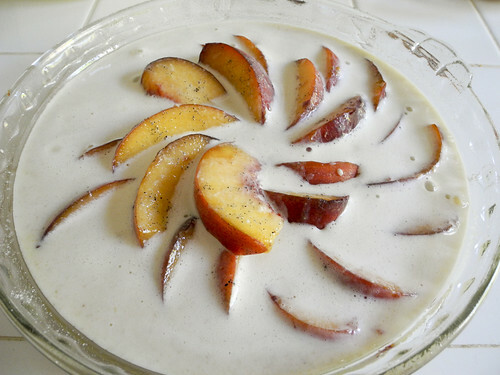 I also realized that peaches would taste lovely with Cardamom and I do have a bottle of Cardamom I’m trying to use up. Perfect I had my recipe and it’s even healthy! Even if you eat 2 slices you are under 150 calories and full of protein and low carb. It’s the perfect dessert! Spray 10″ pie dish with cooking spray and sprinkle with sugar. 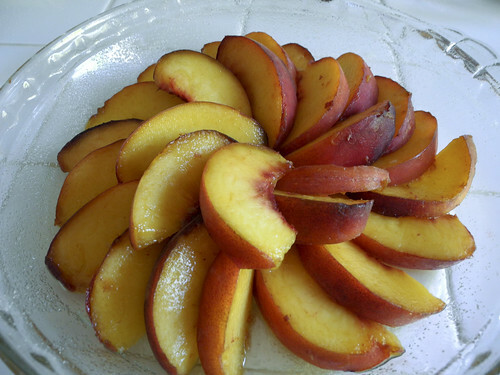 Arrange peaches in a pinwheel design and sprinkle with sugar. Blend flour, salt, eggs, sugar, milk, and cardamom until smooth. Pour over the top of the peaches. Bake the clafouti until puffed and golden, 45 to 55 minutes. Let cool. Serve slightly warm or at room temperature. Yammy……I want to try this recipe, it looks delicious!! Thanks for sharing!